To become a leader, learning must take place in a leadership environment. Billions of dollars are wasted on training with no evidence of transfer to workplace behavior. Training has so much potential, but does not produce the expected results. Too often training has been using inappropriate methodology, following fads, ignoring research and operating on false assumptions. When employees attend training courses, there is an expectation that there will be a positive change to their work performance. This expectation is not normally met because of the wide gap between training and workplace behavior. This failure to transfer learning to behavior is severely limiting business performance, profits and personal development. Every year the U.S. spends an excess of $100 billion on training and development, and much of it is wasted. The blame for this loss must lie squarely on the shoulders of the buyers of training. They are the products of the same failed training systems they currently support. Despite huge advances in research and understanding how people learn, they have failed to keep up to date and are content to support ineffective training processes that mirror their own experience. Low demands for measurable results from training have encouraged the proliferation of training providers delivering ineffective training contributing to a lack of transfer from learning to workplace behavior. 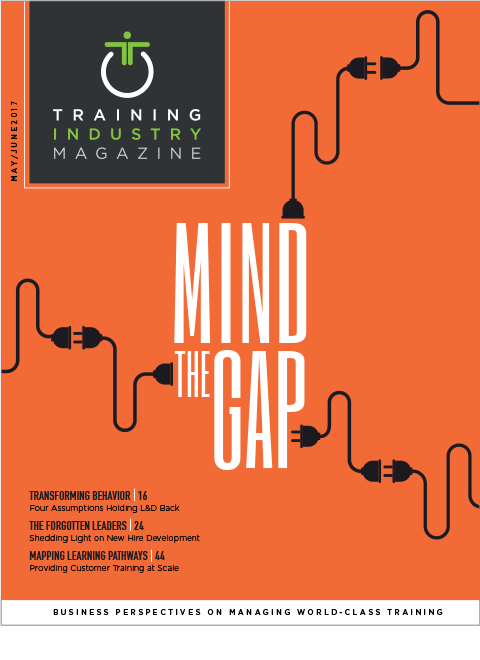 There are a series of assumptions pervading the training industry that have created and reinforced the gap. These assumptions have been around for a long time and contribute to a colossal waste of money and resources. Let’s examine four of those assumptions. The first assumption is if people are not doing what is required and they are told what to do, they will comply. Training courses tend to focus on telling people what to do and how to do it rather than engaging human curiosity through a process of discovery. It is believed to be more cost effective to tell people rather than let them learn their way through to a solution. In reality, the opposite is true. Think about your organization. Is it common to see attempts to create the “right” behavior by telling people what to do? Are they told to work harder and smarter? Are they told to show their initiative and to increase their productivity? Are they told to improve quality? Are they told to work more safely? They may be told in a variety of ways, through emails, in-house magazines, newsletters, toolbox meetings, training courses, annual appraisals, bulletins on notice boards, production meetings and face-to-face. Telling the workforce may be subtle or blatant, but either way it has not proved to be very effective. Most training operates under the assumption that people will do what they know. Instructor-led training courses are firmly based on the belief that “knowing equals doing” which has led to the conviction that “more knowing equals better doing.” Experience dictates that people don’t do what they know, yet businesses spend inordinate amounts of money supporting this basic misconception. This mistaken belief has invaded training design thinking to the point where training is promoted on the quality and quantity of the content – not the result. Training courses have been crammed with vast amounts of information without caring if any of it is retained, let alone applied. This preoccupation with information has been based on the false assumption that the learner will perform in the correct fashion when they return to work. The second assumption is that we can train groups in classrooms to develop practical workplace skills. Training providers have taken an academic approach to the process of skill building, but classrooms don’t provide the context and environment to develop practical skills. Classroom training is used to develop practical skills such as leadership, selling, emotional intelligence, communication, customer service, supervision and management. Information is confused with skill. Because the academic model has successfully existed for centuries, practical subjects have been shoehorned into it with the vain hope they will work the same way. It is evident that practical skills are best learned through a gradual process in the environment they are used. If you want to learn to swim, you must get wet. To become a leader, learning takes place in a leadership environment. Trying to train and develop a group of employees in practical and individual skills out of context has increased rather than reduced the gap between training and workplace behavior. A two-day leadership course in a classroom without follow-up coaching will not increase leadership skills. The third assumption is that learners will remember and apply the content of the training courses. This false assumption has been roundly contradicted by Dr. Henry L. Roediger of Washington University in St. Louis with his research on the rate of which human beings forget information. This research has profound implications for training design because it now suggests that training should include strategies to interrupt the process of forgetting. If the learners cannot remember the training content, they logically cannot apply it to their behavior. The forgetting factor is exacerbated by training courses focused on delivering as much information as possible in the shortest possible time. This assumption of remembering is totally misplaced if 50 percent is forgotten within the first hour after training and 90 percent is lost after a week. The fourth assumption is a big contributor to the gap between training and workplace behavior. We treat learners as if they are all the same. We deliver the same information and concepts to groups of individuals in the same manner, in the same place and in the same timeframe. This suggests strongly that there is an assumption there will be an even uptake of information across the individuals in the group. When we consider a group of people and focus on their characteristics, we begin to realize that there are many individual differences. These will have important implications on the style, presentation, content, speed, relevance and application of the training. If effective training courses are to be delivered, the design of the program must take into consideration the majority of these individual characteristics. “One size fits all” instructor-led training courses have avoided catering for differences in group members for a variety of reasons. The principal reason appears to be that results from training are far less important than the financial benefits derived by the training provider or the cost of the training. This is demonstrated in the size of training groups. When consideration is given to some of the human differences represented by a random group of participants on a training course, you can see how current practices make it almost impossible to deliver the results we expect. This failure to transfer knowledge into workplace behavior is compounded by the size of the group. It is universally recognized that the larger the group of learners, the less the training will achieve in terms of retention let alone transfer to the workplace. Despite these human differences, there are a myriad of “one size fits all” training courses that are prescriptive, delivered by a trainer who is not accountable for results and working to a rigid timetable. The variety of human learning characteristics limit what can be learned through conventional classroom training in groups. These four assumptions are embedded deeply in the way training takes place and actively supported by institutions and training providers. It is little wonder why there is a lack of transfer between training and workplace behavior. It would make sound economic sense to design training programs aligned to the way humans learn to bridge the gap between the training content and subsequent workplace behavior. Peter L. Mitchell is an international specialist in workplace behavioral change. He is a trainer, writer and speaker.